I wonder who the jolly group ariving by carriage are? It looks like a typical village pub, with nowhere to park! What a charming spot again...back in the day....probably a favorite place to happen by after a long day of work! As usual, I am intrigued more by the figures and vehicles than in the landscape. Does it look to you like there are people seated in those two carts in the middle and back ground? Perhaps they were going on an excursion. I continue to be struck by the fact that you are able to find so many then-and-now images where the buildings (if not the fine surroundings) are all in tact or nearly so. It is a lesson for city planners. We do not see the "not nearly as idyllic" surroundings but I can't help but think that here (US) the pub would have been replaced by a 'Hooters' - shudder! 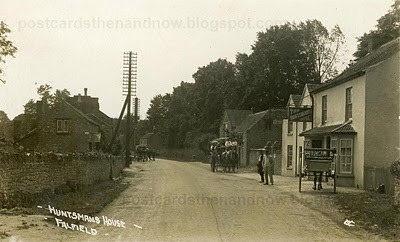 As lovely as the present day photo is it hasn't got the charm of the postcard. I enjoyed the now and then peek into this place. At least the now picture doesn't show a lot of cars. I like the view of the woman and the sign that can be read when enlarged. Nice cards, I really like the clouds in the second and nothing like the carriage in the first. All sorts of scenarios can be imagined. It ws the carts an carriages that interested me. Today's vehicles go by in a blur. If only they had time to stand and stare! If it's the A38, it must normally be pretty busy. No doubt the buildings on the left were demolished to allow the road to be widened. At least they left some greenery. I'm wondering what the thingie is on the left that these days would make me think a cell tower. Obviously it's not. It did gain some greenery over the years though. I'm just building a wall and could have made good use of the rock from the wall they tore down. An interesting pub. Good Ale?